To measure blood pressure, your doctor uses an instrument call a sphygmomanometer, which is more often referred to as a blood pressure cuff. The cuff is wrapped around your upper arm and inflated to stop the flow of blood in your artery. 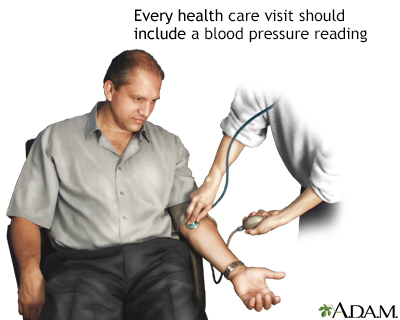 As the cuff is slowly deflated, your doctor uses a stethoscope to listen to the blood pumping through the artery. These pumping sounds register on a gauge attached to the cuff. The first pumping sound your doctor hears is recorded as the systolic pressure, and the last sound is the diastolic pressure.